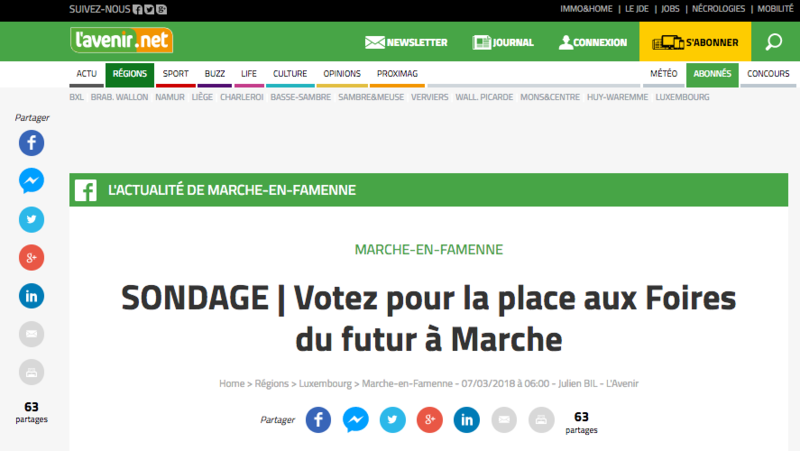 Marche-en-Famenne, a small town with 17.401 inhabitants in the Belgian province of Luxembourg, did a fantastic job at launching its CitizenLab participation platform. In less than one-week time, their e-democracy platform welcomed 4.500 unique visitors and turned >1.000 of these into active users. Discover in this article which 3 key acquisition channels helped them turn their launch into such a great success. 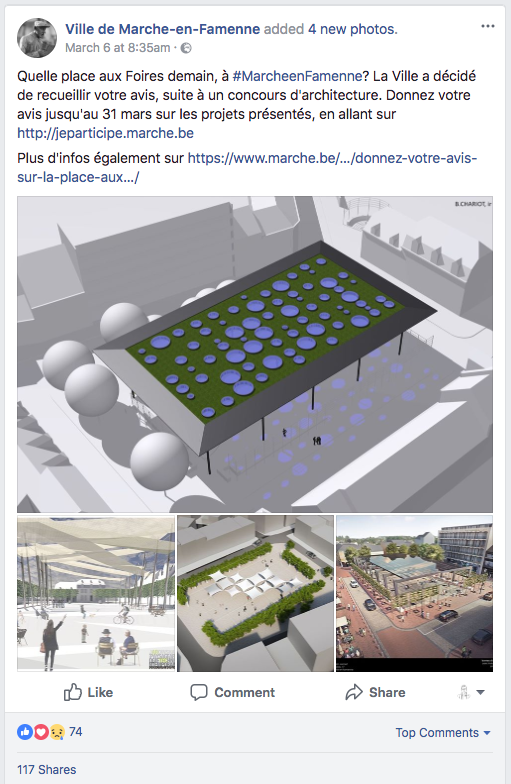 The city of Marche-en-Famenne wants to give a new face to its central square, both aesthetically as functionally, in order that it becomes the place-to-be in town where regularly events take place. This square is therefore an is a meeting point for citizens of the surroundings of Marche-en-Famenne. To decide on the future design of the square, it uses CitizenLab to consult its residents to choose their 2 preferred architectural plans, out of 4 possible options. The platform launched publicly on the 6th of March, and voting remains possible until the 31st of March. The decision of the citizens will represent 35% of the final decision. The real success and interest of this consultation lies in the two following pillars: firstly, citizens have a say on an emblematic part of their city and daily life, and secondly, their influence and decision is made quite direct and straightforward thanks to the CitizenLab platform. Go to the platform: https://marche-en-famenne.citizenlab.co/. Organising a launching event and writing a press release are usually two efficient ways to attract the attention of the local media. At these occasion the message must be concise and clear: explain where the idea of the platform originates from and what the city intends to achieve with it, especially if it tackles concrete projects like the renovation of a square in Marche-en-Famenne. 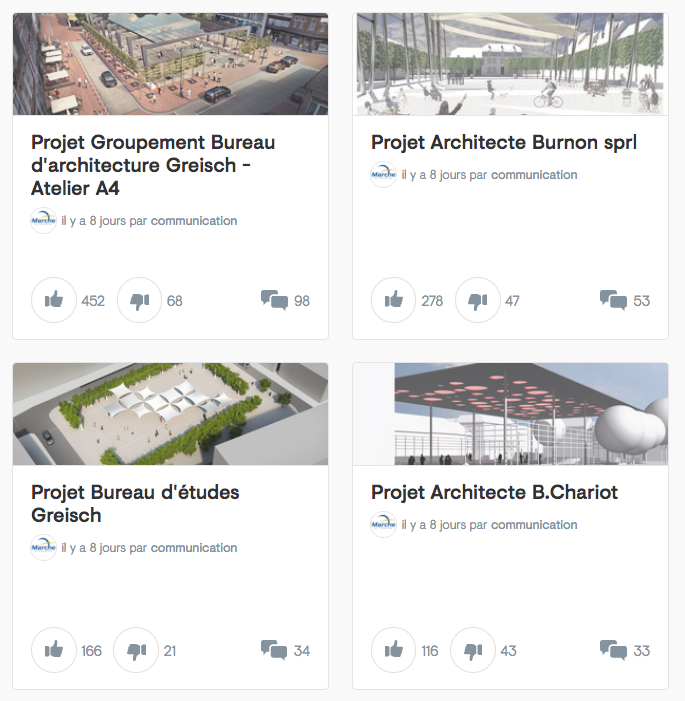 Write an engaging Facebook post by sharing specific projects or ideas that are already on the platform and ask clearly what citizens are expected to do, and by when: in the example of Marche, the projects to pick from are clearly illustrated in the visuals of the post, and the call-to-action – vote – has a clear deadline. It’s also important to share the proper links for the citizens to easily access to the platform where you intend them to: on a project, on an idea, etc. Make it easy for them to participate. To make the launch even more impactful the city changed the cover picture of its Facebook page to include all the information needed regarding the consultation, and especially how to access the platform. For a city, the website is usually the most visited channel when citizens are seeking specific information. Take advantage of this exposure by inviting your website audience to participate on the platform by sharing the link in an obvious and attractive way! 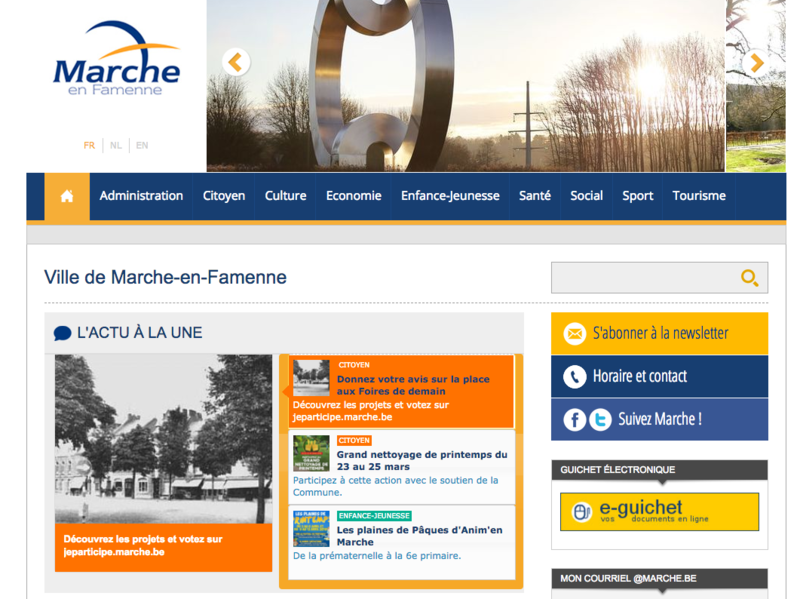 The city of Marche-en-Famenne chose for a URL that is easy-to-recognise and contains a clear call-to-action: https://jeparticipe.marche.be. This URL is also a good choice because it is timeless and will still be relevant for other consultation initiatives in the future. Finally, what also made the strength of this launch is the synchronisation between all the channels mentioned above. For instance, the launch date was planned on the day of the release of the municipal printed newsletter, and it was accompanied by online support via social media.